The lid driven cavity problem illustrates a flow in a cuboid. The top wall moves from left to right with a constant velocity, while the other walls are fixed. The fundamental feature of this often studied fluid flow problem is the formation of a large primary vortex in the center and two smaler vortices near the two lower edges. 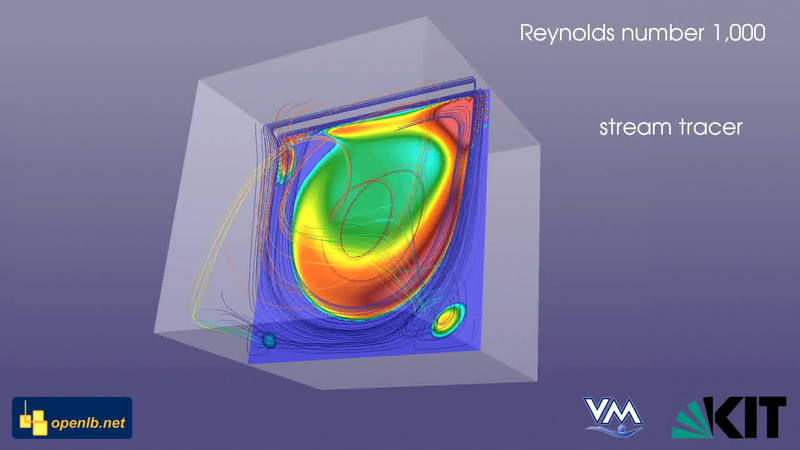 Different techniques are applied to visualize the fluid flow including the vortices with the cavity. The source code of this simulation can be found in the open source software OpenLB (www.openlb.net). U. Ghia, K. N. Ghia, and C. T. Shin. High-Re solutions for incompressible flow using the Navier-Stokes equations and a multigrid method. Journal of Computational Physics, 48:387-411, December 1982.